To update an existing mailing list and announce a new Technical Information Service. The 3-stage direct mail campaign was targeted to 700 electronic design engineers. In the first stage a stress balloon was sent with the message, “Quietly Going About Your Business”. 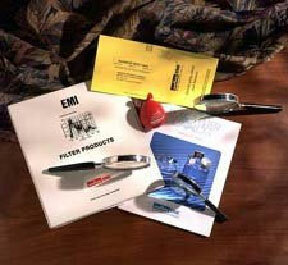 The theme was selected because the company’s EMI filters make business products quieter. Phase two of the promotion was a catalog with a bounce back card asking for additional information that would be used to update Murata’s mailing list. In phase three of the promotion, respondents received a three-ring binder to hold future literature and another forthcoming catalog. .
Murata reported 600 of the 700 targeted engineers responded.